More on History of Islam in China: CLICK HERE ! During the later Qing Era, no less five wars and campaigns were waged against the Muslim Minorities: In and around Lanzhou in current day Gansu Province and in the Tarim River Basin (1820 AD-1828 AD) in the first year of the Reign of the DaoGuang Emperor - The Khojas revolt against Chinese rule in Altishahr (the Tarim Basin), in Che Kanio (1830 AD), in the Western Territories or Sinkiang (l847 AD), and in Yunnan, Gansu and Shaanxi Province there were multiple muslim rebellions between 1855 and 1873 AD. Each Time the rebellions were suppressed and retributions for the Muslims were severe. Mosques were raised and whole villages displaced or even burned to the ground. It was all out war. Half the Population was exterminated. According to the Emperors decree the Heads of dead Muslims had to be delivered to the Imperial Court in Beijing to give proof of the "success" of the brutal campaign of ethnic clensing. However, the task proved impossible. Too many muslims were killed and so in the end the Generals could only have the ears of the dead cut off, put on strings of rope and shipped to the awaiting Emperor. In the year 1873 AD, the Qing Dynasty (1644 AD - 1911 AD) general Zuo Zongtang took Jiuquan Town from its Hui defenders commanded by Ma Wenlu, putting and end to the Dungang Wars. In the aftermath Han immigrants were brought in to sustain the territorial gains. 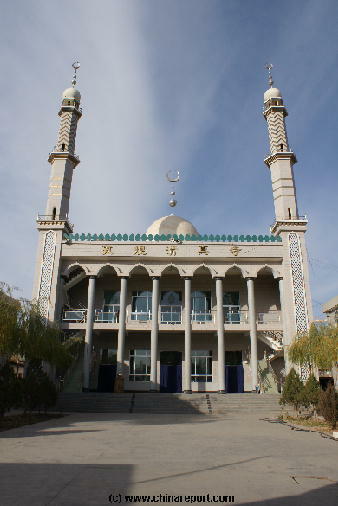 The Mosque in Dunhuang, Western Gansu Province in November 2007. Today the Village has only a modern mosque as the old mosque in town was repeatedly destroyed during the Ching Dynasty Era, whereas the establishment of the Peoples Republic of China and initial frictions with Muslim Groups in the West have led to a large period of closure. Only after a thaw in religious policies in the 1980's, Mosques have reopened officially. 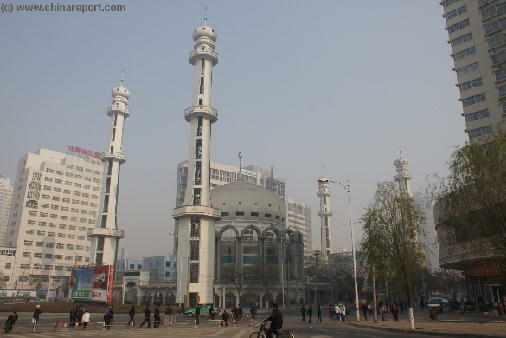 The Grand Mosque in Lanzhou, the largest of several Mosques in the Capital of Gansu Province in November 2007. Whereas during other Dynasties religious tolerance and a certain degree of equality between the many Ethnic Groups in the Nation had benifitted the Muslim Ethnic Groups and Tribes, the Qing Dynasty would turn out to be dark age for the Islamic Communities of China (P.R.C.). The Main Regions involved were the current day Xinjiang-Uygur Autonomous Region which at the Time was mainly populated by the Hui Hui (Dzungar) Ethnic Group, and connected parts of Western Gansu Province, North-Eastern Gansu Province, Ningxia Hui Autonomous Region and as a last large Parts of Shaanxi Province. Responsible for the conquering of the West in the Qing Dynasty Era were the succesful first 3 Emperors: Kangxi (1661 AD - 1722 AD), Yongzheng and Qianlong (see History of the Ching Dynasty). The latter of these three completed the task of shaping the Chinese Territory that (roughly) remains today as the Peoples Republic of China. As mentioned above, the whole situation arose from the Demise of the Ming Powers and the loss of Central Chinese Control over the Western Regions. Left to themselves, the local Tribes were thrown back upon their own cultural identities, fragmenting the territories into Mongolian (Buddhist / Shamanist) and Muslim Tribal Area's. Furthermore, the implosion of the Ming Chinese Empire left a power-vacuum on the borders of the Nation seducing Foreign Powers to intervene. Such was the case with the Dzungar Muslim Rebellion. full impact of their deeds, ventured to consolidate their powers over more and more bordering Tribes and Nations. There was however a minor complication : The Eastern Mongolians, or Khalka's were Buddhist-Lamaists who had ruled and administered the Western and Mongolian Regions in name of the Central Court in Beijing. Nevermind the temporary lack of Central Authority, The Court at Beijing would not forget about its allies and territories in the West. In 1636 AD, under Leadership of the Son of Khara Kula ambitions moved into a new phase when the Oirat Dzungars sent a Military Force south into Tibet. Other Wars were fought with the Kazakh Tribes in the Region. Complicated Tribal Alliances and Cultural influences arose in the following decades. By 1671 AD, the third Ethnic Group and Cultural Force in the Region, the Tibetans became involved. Around the Year 1671 AD, a new and young Oirat leader arose, one Chaldan. Having studied under the 4Th and 5Th Dalai Lama in Tibet, Chaldan's Leadership was under Buddhist Influence and through a series of tribal wars and events, the year 1677 AD saw the Dalai Lama award the highest leadership title of Boshughtu Khan to the Oirat Leader Chaldan. As the laws in Tribes go, this established a supreme and inherited rule of Khans over the Oirats (Dzungars), solidifying tribal organization and military powers. It was recipe for disaster that would come to haunt the Tibetans. With their Cultural Influence and some form of authority established among the Oirats, the Tibetans became increasingly identified as part of the Nation, which in turn invited a growing Dzungar (Oirat) interest in this Mountainous Nation. Meanwhile, in 1644 AD a peasant revolt struck the Imperial Capital of Beijing, resulting in the final end of the Ming. During the ensuing chaos,the Manchu Armies of the Dynasty of the North-East are led into the Shanhai Pass of the Great Wall of China, to descend on the Imperial City, restore order from Chaos and establish the Ching Dynasty. Well organized Militarily, it would not be long before the Qing would reassert their claim to Sovereignty over all Previously held Territories (and more). The Kangxi Emperor, who's Reign had started in 1661 AD on the day his Father the Shunzi Emperor Died, would become the Longest reigning Emperor in the History of China with 61 years in Office. A Strong Miltary Leader, Kangxi was initially occupied with a Civil War taking on the "Three Feudatories" (1673 AD - 1681 AD). In the succeeding period however, large scale Military Campaigns under the personal directions of the Emperor swiftly re-conquered Taiwan (1683 AD) unifying traditional China once more. After solidifying its Rule over Chinese Heartlands, the True conquest under Kangxi only began in earnest with the defeat of Russians at the Kerulan River in 1685 AD, fixing the part of eurasia south of the river Kerulan for China. A next move by the Kangxi Emperor was the skilfull diplomatic Inclusion of Mongolia as a chinese protectorate, a very strategic manouver by Kang Hsi solidifying alliance with the Buddhist-Lamaist Tribes of Eastern Mongolia (the earlier humiliated Khalka's) making possible further expansions of Chinese Empire towards the West and North-West. Kangxi died in 1722 AD, just after the succesful realignment of Tibet with the Qing Court, putting a temporary stop to the Chinese Activities to establish Qing Dynasty powers further Westward. With Tibet secured a Vasal State with semi-autonomy, the next Reign of the Qing Dynasty would be under the Yongzheng Emperor, a paranoid Man with a focus on internal rule. Thus, the rise of a Chinese military threat against the Dzungars was temporarily postponed. By 1735 AD, however, a New Emperor Rose to the Throne in Beijing, with Fresh Ambitions. The Qianlong Emperor, Grandson of Kangxi, would become the second longest Ruling Emperor of the Dynasty and his Reign Period would be fully dedicated to the complete and final conquest of the Western Regions, the Eastern Dzungar Khanate (East Turkestan) and Tibet included. Between the Years 1755 and 1757 AD, Qing Dynasty Armies campaign in the West with the aim of destroying the East Turkestan State and regaining the Western Territories once held by the Chinese (during the Han and Tang Dynasties). Independent East-Turkestan, the Eastern Section of Greater Turkestan, the Dzungar (Oirat) Muslim Khanate, is violently subdued after the capture of the Dzungar Khan in 1755 AD. In the aftermath of the Death of their Supreme Tribal leader, Dzungar Tribes fight for their lives against overwhelming odds. 70 to 80% of the Dzungars, some 500 thousand to 800 thousand individuals, are massacred in a campaign of ethnic cleansing and cultural annihilation. The Dzungars, finding their numbers exhausted, are finally defeated in 1759 AD at the Pamir Mountains and Tian Shan near Yarkent and Kashgar. By 1759 AD the Chinese Armies led by their Qianlong Emperor, Grandson of Kangxi, in person have conquered the entire Tarim Basin (Taklamakan Desert) and captured the City of Kashgar putting an end to a bloody ethnic war to eradicate Islamic Influences and Tribes and re-establish the former borders of the Chinese Empire. By 1768 AD, officially renamed "Xinjiang" the Western Territories will henceforth be under special Military Governorship directed by the Emperor Himself. The Genocide perpetrated against the Muslim Inhabitants of West have resulted in depopulation of the Hexi Corridor, the Lop Nor Region and Oasis Towns of the Taklamakan Desert. A flow of Oirat (Khojas) refugees Flee to the North and West to Kokand, a city in current day Fergana Province (Fergana River Valley) in eastern Uzbekistan. In the Aftermath of the Fall of East Turkestan and the Establishment of Xinjiang, Han Chinese setllers are sent from all over the Empire to fill in the depopulated area's earlier occupied by the Muslim Dzungar (Oirats), a measure intended to decrease any chances of a repeated Muslim uprising in the Regions. The Remaining Islamic Populations are put under tight controls and their religious expressions discouraged. After 1771 AD the Qing Dynasty attempts a march further West into Central Asia with a military campaign to bring the Kazakhs into a vassal relationship. Meanwhile in in the Khanate of Khiva (or Khorezm) a new Islamic Khanate the Uzbek Kungrat dynasty takes shape. 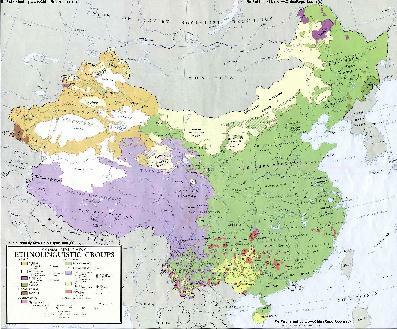 Thus, as can be infered from the above, the Ch'ing Dynasty (1644 AD - 1911 AD), although being established by one of the Minorities, the Manchu of North-Eastern China, would be remarkably less tolerant of Minorities than earlier Dynasties. Especially Islamic Tribes and Nationalities fell victim to Imperial Powers, finally becoming embroiled in an religious and ethnic war without mercy. Under the Qing Dynasty, the Han Nationality would land on the bottom of the social class systems, but all the other Ethnic Nationalities, including the influential muslims suffered. Due to their earlier support to the Rise of the hated Mongol Yuan Dynasty muslims in Qing Dynasty China remained suspect. Anti-Mongol sentiments were strong, especially when the Mongols were Muslim rather than Buddhist-Lamaist. Former Allies of the Mongols could not expect to be popular. Especially not those had destroyed the Holiest Shrines of State Religion of Buddhism, as the Dzungars had done. When later during the 18Th Century the Muslims again reunited and tried to re-establish their lost indepenent state (East Turkestan) in the West, firm Anti-Muslim sentiments took root among the other Nationalities joined in the Qing Empire of China. At the beginning of the 17Th Century Muslims in Central Asia suddenly reasserted themselves, uniting large parts of current day Kazachstan, Uzbekistan (Altai Mountains and the Ili River Valley.) and Xinjiang AR under the Muslim Rule of the Dzungars, an alliance of Oirat Tribes, native to Western-most Mongolia. In the following period centuries old animosities between the Khalkha Mongols (East Mongolian Tribes) and the Oirats (a constellation of local Islamic Tribes with similar traits) and a third group, the Tibetans flared up. Initially, Three Tribes of the Oirats united under the Banner of the "Dzungars" under supreme leadership of Khara Kula. Trouble only started in earnest when in 1606 AD, the Oirats attacked the Mongol Khalka Tribes (East Mongolians) in what was mainly a War of Revenge. The Khalka's had earlier attacked the Oirats and forced them to abandon their homelands in the Chobdo (Khovd) Region of the current day Republic of Mongolia. By 1717 AD, a new round of Tribal Political Affairs, this Time arising in Tibet sparked a new War in the Far West. In opposition to a pretender successor to the Dalai Lama, the Dzungar Armies invaded Tibet, deposing and Murdering the Fake Dalai Lama. Initially, the move was welcomed by the majority of Tibetans, however the tide of sympathy for the Dzungars swiftly turned after the mainly Muslim Dzungars made the Mistake of looting the Holy Shrines in the Capital of Religious and Administrative Capital of Lhasa. Monasteries were burned, shrines destroyed and looted and Monks killed resulting in a total outrage with the highly religious and pious Tibetans. Furthermore, by 1717 AD, the Qing Dynasty had gained full control over the Chinese Empire and its Ruler, the Emperor Kangxi (Reign: 1661 AD - 1722 AD), had been following the situation in the West for some Time eager to become involved at the right time. The latest round of War, followed by the desecration of Tibetan Buddhism-Lamaism's' Holiest Shrines provided a Great Pretext for the Chinese Emperor, a Buddhist-Lamaist himself and traditional ally of the Tibetans, to make his moves and become involved. Already in the next year (1718 AD) a Chinese Army launched an Invasion of Tibet. Although it was initially repelled and defeated. The failed invasion announced the entry of the Powerful Qing into the Political Game for dominance in the Region. By 1720 AD the Chinese Armies were more successful in invading Tibet, and with help of the local population expelled the Dzungar Armies from Tibet in defeat. The Dzungars had been gaining in power for over a Century, establishing their own Khanate in the West, however the shadow of the Imperial Ching would eclipse further Dzungar ambitions. Khanate, now known as (East) Turkestan. The State of Turkestan, established with support of the Russians lasted for a brief 10 years as an indepent nation from 1865 AD to 1876 AD. In 1876 AD the Ching Dynasty began its reconquest of the Western Territories (Xinjiang). 1878 AD Kashgar falls to the Chinese, under Tso Tsung-t'ang. 1881 The Treaty of St. Petersburg between Russia and China results in the return of the Ili Valley to China. In 1884 AD Xinjiang officially becomes a Chinese province, which it remains today.